I usually don't make New Years resolutions, but I do like to set goals for myself...in January or any other month. Well, this year we set some goals as a couple and one of them was to eat more protein. So I am trying to sneak more protein into our diets. 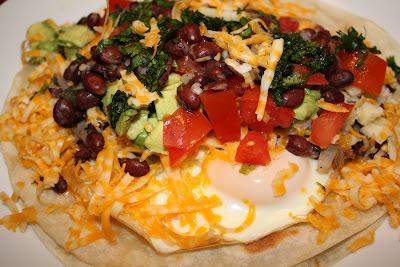 We recently made huevos rancheros for dinner. It is traditionally served at breakfast, but I don't think I could stomach this in the morning. It is more of a lunch/dinner meal for me. There are tons of variations of this meal, we really didn't follow a certain recipe, we just used our favorite flavors. We used flour tortillas and topped them with the goods. Josh fried up two eggs for his, but I used scrambled egg whites. We both used black beans, tomatoes, cheese, cilantro, avocado, and fresh lime juice. I really liked this meal. It was easy, filling, and loaded with protein!! Heat up your tortillas. In a small sauce pan, warm up your black beans with the onion and cumin. Fry up your eggs or scramble your egg whites. Place the eggs on the flour tortilla. Top with the beans. Next, add all of your toppings-tomatoes, cheese, avocados, cilantro, and lime juice. I think I'd have a hard time eating it for breakfast to , but lunch or dinner....let me at it! Not only does this look good it's packed with good stuff! This looks yummy. The blend of wonderful flavors would really wake you up in the morning. Definitely have to make this for my husband this weekend! That does look hearty, healthy and tasty! I have cook-with-more-beans on my 2009 to do list too. OMG, that look extremely scrumptious! One of those TWD corn muffins would be great with these! 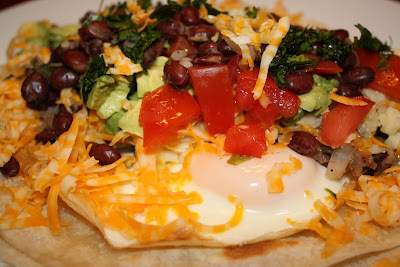 Mimi's cafe has my favorite huevos rancheros, but they ARE so easy to make at home. These look de-lish! mmm I love breakfast for dinner, we're having it tonight! I agree its hard to balance the need for protein, ESPECIALLY with a meat eating husband! I haven't tried these yet, but I have been wanting to. Your version looks delicious for b, l, or d! It one of my very favorite meals for breakfast, lunch or dinner. YUM. Oh I love making this for breakfast, but I can never get a good picture to share. Your picture came out really good! I'd eat this for any meal! I was just thinking that I wish that I thought to serve the Dorie corn muffins with huevos rancheros. Next time, I will be sure to do that and try this recipe! It's one of those anytime meals I think since it has so much toppings to pick from. Sounds better as a dinner to me! Those looks great. I love breakfast for dinner! I could never stomach the thought of these for breakfast either. Your version looks amazing! I love breakfast for dinner! i happen to have an iron stomach, able to consume just about anything at just about any time of day. this here is in the running for best breakfast ever. I have actually been craving this, and now I really need some!! We went to Mexico for part of our honeymoon and ate huevos rancheros every single day. Yours look delicious and have be aching to be back in Cabo! I love Huevos Rancheros but it's been a long time since I made it. But give me yokes. Yum!!!! The picture looks awesome!!!! love these :) and eggs, they're fantastic, i wish i was at home and could eat them 3x a day! 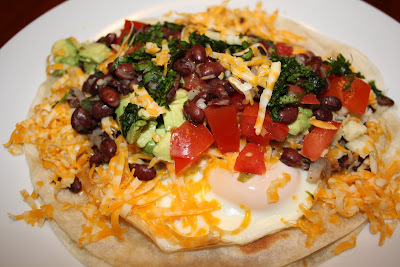 We love huevos rancheros in my house - I made some scarlet runner beans in mole a few weeks back, and I threw some in the freezer just so that we could have huevos rancheros with them. Be still my heart! Maria, you can serve this up to me in the Pond anytime. In fact, it's gong on my upcoming supper list! Yum! super yummy! i get this in restaurants and never made it at home! Get discounts on the items that you purchase. The best online coupon store, ClickMyCoupons.com helps to save your money by using our coupons. This looks delicious - meatlovers would never even miss the meat in such a tsty dish. This is one of my favorite breakfasts. I use corn torts and cover them with refried beans, then eggs, cheese, salsa, tomato, green onion and lots of chopped lettuce. Mmm, good! I could easily go for those huevos rancheros for dinner. They look great!